The Celtic Gnostic Church of St Mary & St John has created something new and unique from some very ancient teachings and traditions. Long forgotten facets of the Mass and Eucharist are brought together to create an amazingly beautiful celebration, that is the Celtic Gnostic Mass. A long time ago our ancestors created a beautiful tradition, which when followed would lead to 'Knowing Thyself'. It helped us realise our true Will, our true Divine potential. It filled us with Gnosis (Intuitive Knowledge) and Sophia (Divine Wisdom) giving us a direct connection to our own Higher Self. It allowed us to live in harmony with nature, to love and care about all of the Great Mother's creations. We knew never to take more than we needed, and to always give something back when we do, this allowed balance to always be maintained. Due to an unfortunate chain of events this knowledge (Gnosis) was lost to the general population. The truth was hidden (Occult) from everyone, and a few unbalanced beings decided to control and just take, rather than allow others to reach their full potential. They jealously guarded the secrets, and slaughtered anyone who dared to secretly pass the Gnosis on. However, some survived in the underground stream. The true teachings were kept safely for a time when people were at last ready to remember the truth and take back the teachings hidden from them for so long... That time is now. 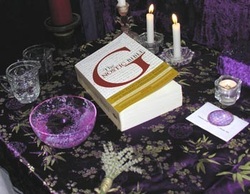 The Celtic Gnostic Mass is part of those traditions and secret teachings passed down. Being part of the Celtic Gnostic Mass is both uplifting and cleansing to your own aura. Many generations of deception will start to be wiped away, giving your own Higher Self a chance to at last connect to you. You will feel an amazing connection to the Divine within you, genetic memories will be triggered and at last things will start to make true and proper sense. Everything will start to fit together. The more you are involved with the Celtic Gnostic Mass, the more your ancestors will call to you, drawing your memories of how things used to be back into your conscious mind. What happens at a Celtic Gnostic Mass? The ceremony is led by a Priest and Priestess, the altar divided into a male and female side. The Priest works on the feminine side, and the Priestess works on the masculine side, all the while bringing balance to the energies. The Arch Angels are invoked bringing the qualities of all the elements into the ceremony. The Priestess purifies and the Priest consecrates. When the temple is ready the Eucharist is prepared by the Priest and the Priestess on the centre altar. A symbolic act of union between the energies is performed and all present partake in the Eucharist which is charged with the energy raised. To know the full extent of the Celtic Gnostic Mass and its significance, it has to be experience. The Church of St Mary & St John performs the Celtic Gnostic Mass regularly at the Temple of Theola in Lancashire, UK. To arrange to attend please contact us.